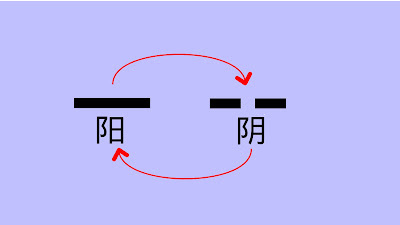 The two-state cycle of a single line: yáng and yin. Last week I wrote about the cycle of alternating yáng and yin, and I invited my readers to look for examples of the cycle in the things they see around them. Were you able to practice this simple meditation? If not, I recommend you try it because today I'm going to tell you about a four-element cycle made from two lines, and an insight into the two-state cycle will give you a foothold for understanding the four-state. This cycle also abounds in the world, but it is easier to find with the mind's eye than with the physical eyeballs. This four-state is notated by using two lines, one stacked on top of the other. 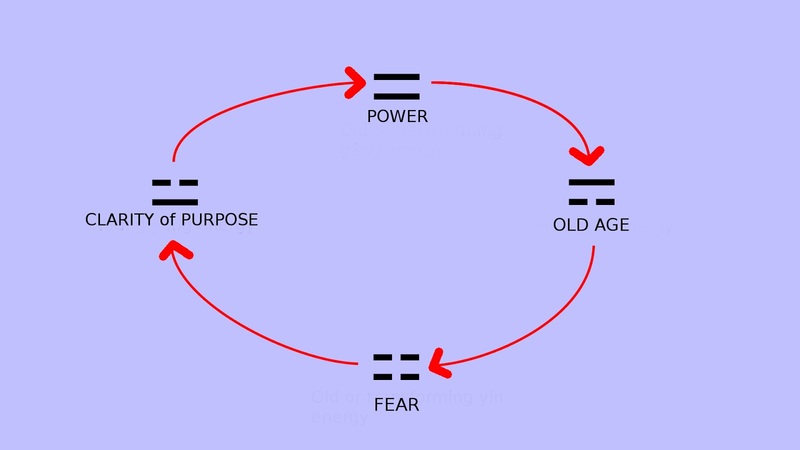 This cycle represents the essence of a state that is in continuous transition. In my charts, I draw the progression of cycles in a clockwise fashion. 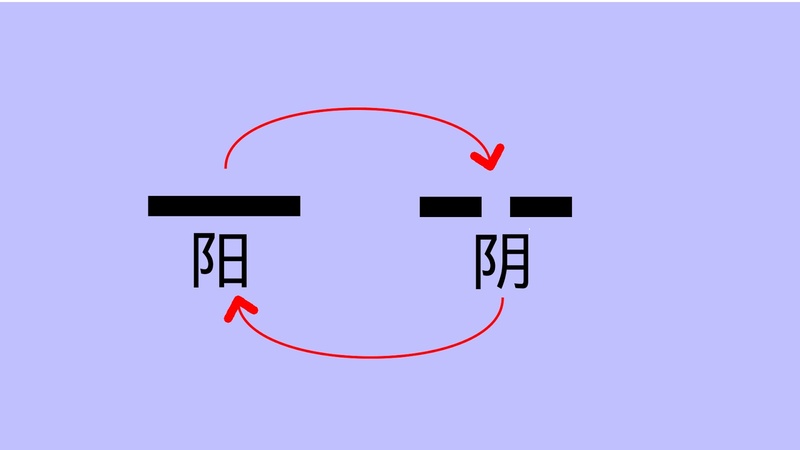 In any cycle involving a stack of two or more I Ching lines, the new line is added at the bottom, and the old line comes off at the top. The two-line, four-state cycle tends to represent the constant ongoing change of growth and learning processes through time. The four-state cycle is imbued with the idea that conditions are constantly changing and they are purely yáng or yin so fleetingly that they are never really pure—I'm reminded of limits in early calculus classes in which a series converges with a number but never really gets there: you can, for example, only approximate Pi. Purity, in most senses of the word, is rare. Never does a chemist have a vial of a substance that isn't adulterated at least a bit with a trace of anything and everything—you'll see 99.9% pure or even 99.99999% pure, but only a liar touts 100% pure. Food, especially food made in a factory, inevitably contains traces of unmentionable things (and I don't mean the discomfiting things like pig snouts that are listed on the ingredients label); and as we shall see in a moment, the transition from winter to summer requires a whole spring unto itself. Spring contains the fading vestiges of winter and the slowly emboldening summer. A human's behavior often contains the seeds of his own demise. A smoker provides an obvious example, but so too the runner's habit of ten miles every morning contains the seeds of a potentially long life. My life spins from spring and summer through fall and winter in many ways, and every aspect of me is living and dying at once. As Bob Dylan puts it in "It’s Alright, Ma (I’m Only Bleeding)", "That he not busy being born is busy dying." Dylan had something closer to free thinking as opposed to conformity in mind, but I mean everything in its myriad aspects all at once. I use the seasons to speak of all sorts of phases: All life is like that, and to understand it, survive in it, and be successful in it, I must anticipate its summers and winters. What it is now is not what I should expect tomorrow. As a friend long ago taught me: life is messy: you have to wallow in it. Lawmakers often fall prey to the assumption that the world is full of unchanging constants—especially constants that they themselves create—and this is called the assume-a-block-of-wood fallacy. With every new law, politicians expect behavior of the people will change, but they have no understanding that a river will find its way to the sea no matter what obstacles you put in its way. For example, laws ostensibly calculated to prohibit drugs only serve to change how drugs circulate to their end users, and this outcome is so predictable that the prohibition laws indicate that the politicians are not truly interested in prohibition except as a way to drive profits higher. A legislature genuinely interested in the health of its people would not treat a leading health issue as a criminal problem, which only serves to further alienate the drug user from that leadership, but as a health problem that they reach out to treat in clinics with therapy. My favorite use of the seasons to allude to the vicissitudes of life lies in the opening credits montage of David Lean's film of Doctor Zhivago. The background upon which the titles are superimposed slowly rotates from winter—the film begins in winter—through spring and summer, then fall before it returns to winter again. The sequence ends after two cycles in the fall before what would be the third winter. One could perhaps write a masters thesis on how the story itself could be construed as two seasonal cycles. inserted at the bottom and an old line comes off the top. 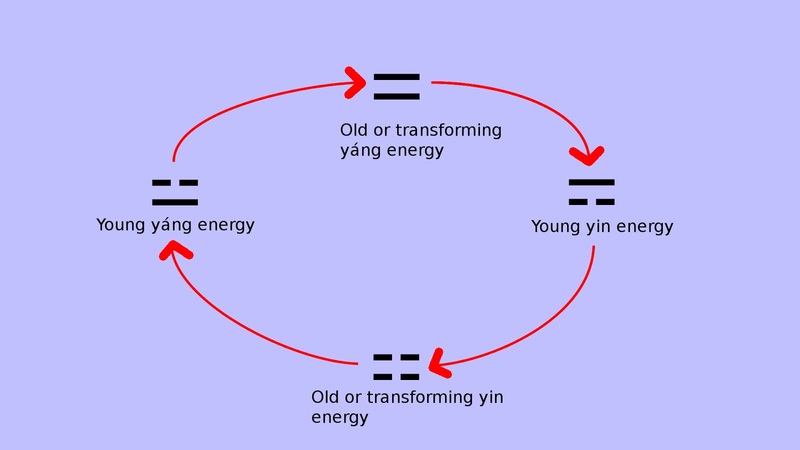 The yáng and yin are each divided into young and old (or stable and transforming) energies. 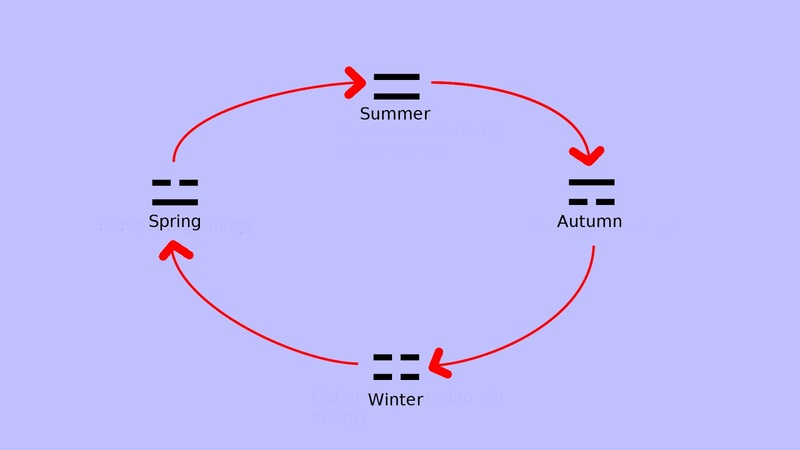 To rely yet again on our analogy to the seasons, I can think of the warm seasons as the yáng seasons, and the cooler seasons as the yin seasons. Spring has the young yáng energy because it is busily becoming the warm seasons, but summer has the old yáng energy: it is fully into its warmth, but its old confidence decays into overconfidence, and it begins, in its old age, to lose its grip on the weather. 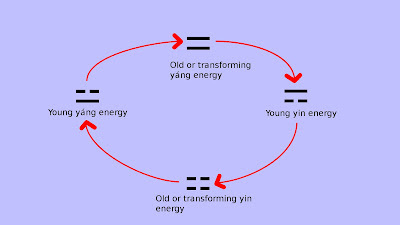 The same happens with the cooler seasons: the fall is the immature yin energy, and the yin is the old yin energy that slowly loses its grasp to the onslaught of the young yáng of spring. as a four-state yáng and yin cycle. In Carlos Castaneda's The Teachings of Don Juan: A Yaqui Way of Knowledge Don Juan, Castaneda's shaman and teacher, explains the four-state cycle of experiential learning. Don Juan labels each of the four stages "enemies," and in a sense they are, but that is largely tied to the animistic metaphors in which Don Juan couches his terms. I will try to make things a little simpler by referring to these enemies as just stages. This cycle of learning applies to everything that you can learn, from practical things like cooking a chicken, riding a bicycle, or playing piano, to a professional career in law and medicine. It applies to any endeavor, whether it's making love or going through the workday's morning routine to get out the door on the way to work. If I set out to learn to play piano, I might start with the Suzuki Piano School, Volume 1. The beginning pianist does not make beautiful music, so discipline drives the interminable exercises and scale practice. Eventually I can derive some pride and pleasure in having gained an ability to do what Suzuki asks me to do, and there is my clarity of purpose. Finally I master what's in the book, and there is power. At some point, the exercises of Volume 1 no longer have anything to offer, and I reach the stage of old age. It's at that point that I should move on to Suzuki Piano School, Volume 2, at which point I begin the entire process again with the new material. Even for the most indigent person, life is filled with endeavors from the time I rise up until I lie down. Even if I am doing "nothing," I am doing something, and that couch-potato being is something for which I passed through the four stages. A day is filled with hundreds or thousands of activities, no matter how insignificant most of them may seem, and for each endeavor I am at some stage in the four stages. 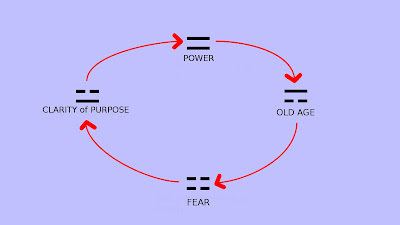 Naturally fear corresponds to the transforming yin energy, and power corresponds to the old or transforming yáng energy. It's important to note here that the old age stage leads inevitably to the fear stage of something new. In this series of blogs, this is the first example of the existential algebra of the I Ching at work. As you can see, there is no magic or divination at work here but only a carefully considered bit of common sense and keen observation. It is from such sense and observation that the wisdom of the I Ching is composed. As an exercise for next week, identify some of the endeavors in your life and the stages in which they are. We will look at some endeavors with sources that will surprise you.